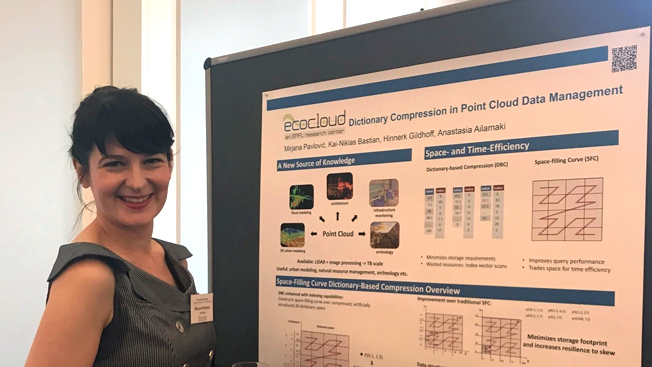 Mirjana Pavlovic, a senior Ph.D. student, and Anastasia Ailamaki, Professor and Director of DIAS Lab at EPFL, won the distinction for their paper “Dictionary Compression in Point Cloud Data Management.” Their co-authors were Kai-Niklas Bastian and Hinnerk Gildhoff from SAP SE. In the paper, Pavlovic and others propose a time- and space-efficient solution to storing and managing point cloud data in main memory column-store DBMS. This could fulfill a long-felt lacuna in the management of point cloud data. It is extremely relevant in a world where the volume of point cloud data is increasing at a rapid rate due to advanced data acquisition and processing technologies now available with data scientists. Conventional solutions are unable to handle this massive volume of point cloud data. On the other hand, Space-Filling Curve Dictionary-Based Compression (SFC-DBC), the solution developed by the researchers, offers efficient query execution without putting extra pressure on storage resources. It minimizes the storage footprint and increases resilience to skew. The team evaluated the performance of SFC-DBC in the context of SAP HANA, a database management system developed by SAP SE. The results were extremely encouraging; compared to existing solutions, SFC-DBC fared 61% better in terms of space and up to 9.4x in terms of query performance. Lead author Mirjana Pavlovic will be in Seattle to receive the meritorious award. Each year, the ACM SIGSPATIAL conference brings together researchers, developers, users, and practitioners to foster interdisciplinary research on geographic information systems.